There is no more distinctive and iconic a garment than the Hawaiian shirt. This quintessential fashion statement pays homage to one of the world's most extraordinary landscapes and to the spiritual and philosophical mores of Island culture. Hawaiian "tiki-style" textiles have evolved from the traditional kapa fabrics made from tree fibres to the popular Aloha shirt we see today. 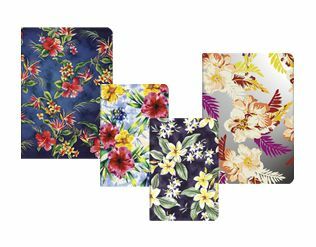 These exuberant flower and foliage prints have always reflected the natural beauty of the Hawaiian Islands infused with the vibrant expression of the aloha spirit. More than just a traditional Hawaiian greeting, aloha is a way of life. "Alo" means "sharing in the present" and "oha" refers to "joyous affection". Hawaiian garments went upscale in the 1940s when Alfred Shaheen pioneered tropical prints to high fashion. His designs incorporated images from the islands' lush natural world and suggested a postwar optimism and modernity. Contemporary designs, including those gracing our covers, continue to capture the essence of aloha. Our series is inspired by today's Hawaiian prints and the spirit of joyful harmony that they evoke.